It's a bird, it's a plane, it's a superhero in disguise! We were in a grateful mood last weekend, and shared it with you through the WOW prompt "Superheroes In Disguise" And now we're convinced that superheroes exist in real life. Read the below WOW blog posts that will make you believe in superheroes too! Super stuff, bloggers! Thanks for your heartfelt blog posts. 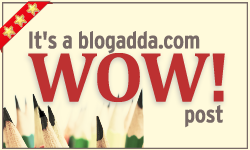 We have a WOW badge for you to flaunt!